In December of 2007, I visited Tokyo, one of the largest and densest cities in the world. While I stood at an intersection near the busy Shibuya Station (which serves 2.4 million passengers per day), it struck me that the city was extremely quiet compared to other cities. Despite the crowd, it was easy to hold a conversation with friends while walking down the street. This lack of major noise pollution extended to other areas of the city; in the apartments I visited, I remember almost never hearing the sounds of neighbors. 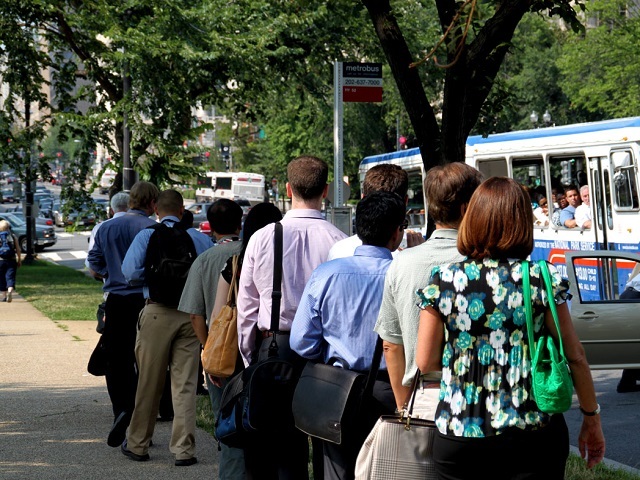 I often find living in DC, that the noises—particularly regarding transportation—are pervasive and affect everyday life. For some, the noise becomes the background of the city, making us forget that there are approaches to reduce noise that can make the city and transportation system more enjoyable. As we strive for density and encourage residents to use public transport, it is critical to remember the human experience of these modes which impacts people’s transport choices, especially when they have alternatives. Depending on the day, noise levels can be quite loud, and it can be difficult to talk to people. This particular road has many pedestrian commuters on their way to the metro, but also sports a lot of cars. Despite the background ventilation noise, this seemed to be one of the nicer options. The loudest part was waiting at the bus stop. You can hear the background noise stop immediately when the door is closed. One of the major advantages is the ability to customize your environment based on temperature, leg space and sound level. There are a lot of noises here: trains, stations, beeping, and announcements. It can be hard to hear important information, and at times feels overwhelming. In sum, there is a lot of background noise—from ventilation or passing cars, to loud, beeping noises—in all of the transport modes, but there are also clear differences. I found the Metro to be unpleasant in this test (is this why people seem so cranky in the morning? ); luckily, however, it is often the most direct way to get across town. Walking down busy street was the third noisiest, and depends on location and context. Overall, the car and bus were generally the quietest during rides. As automobile companies actively work to customize and provide comfort in vehicles, it is time for some city public transport operators to consider comfort, not only for safety and convenience, but to stay competitive. Decision makers design these systems, and wield the power to make the human experience better. What does your commute sound like? What impact does sound or experience have on your choice of where to live and how to get around? What measures can we take to make our experience of living in dense, urban environments even more enjoyable? Let us know in the comments! Tags: DC Metro, Erin Cooper, Integrated Transport, Noise Pollution, user experience, Washington, D.C.